Northcote Road Summer Fete is an established community street festival held in Battersea’s famous shopping street Northcote Road SW11. This popular event has been running for over 20 years and has an estimated attendance of over 10,000 people throughout the course of the day. Attendees are a mix of ages and cultures but predominantly families with young children from the local and surrounding areas. •	Northcote Road will be closed to vehicle traffic for visitors and customers to enjoy. •	The local business community showcasing its impressive selection of independent shops and setting up stalls and activities outside their premises. Huge thanks to our sponsors Brew Cafe Minthairlondon Psycle London and Hamptons International for supporting the #NorthcoteRoad #SW11 Christmas Lights and Pop-up Christmas Market. The Christmas Lights takes place on Friday 23rd November from 4.30-7.30pm. Fun for all, with carol singing, mulled wine, mince pies, Hamptons Santa’s grotto, reindeers, the Christmas donkey, police and fire engines, plus shop promotions. Lights switch-on is at 5pm at Bennerley Road. The Christmas Market starts at 11am on Sunday 25th November and continue until 5pm. You can get into the festive spirit as #NorthcoteRd hosts 50 pop-up stalls offering great gift ideas, plus funfair rides, street food and drinks. Follow/Like @NorthcoteRoad on Twitter and Facebook for the latest details. Northcote Road is once again kicking off the Christmas season with the annual light switch on, Friday 23rd November, followed by the popular pop-up Christmas Market on Sunday 25th November, from 11am – 5pm. The Friday Fun will start at 4:30pm with carol singing, Hamptons Santa’s grotto and lot’s more leading up to the official switch on. So why not come down and enjoy a glass of mulled wine and mince pie while counting down to the illuminations? On Sunday Battersea’ s famous shopping street, already known as a haven of diversity with specialist shops, boutiques and restaurants, will host an additional 60+ stalls offering an amazing variety of Christmas gift ideas. With a great range of clothing, jewellery, toys, home wares, accessories and antiques, we are sure you will solve even your most difficult gift requirements. Whilst browsing, why not sample the great selection of street food, pop-up bars and specialty drinks stalls. We can’t think of a better way to get in the festive spirit. The event is led by Northcote Business Network, chaired by Jonathan Dyson from Hamptons International and is supported by the Clapham Junction Town Centre Partnership, Wandsworth Council. Northcote Road Summer Fete 2018 served up a Scorcher! 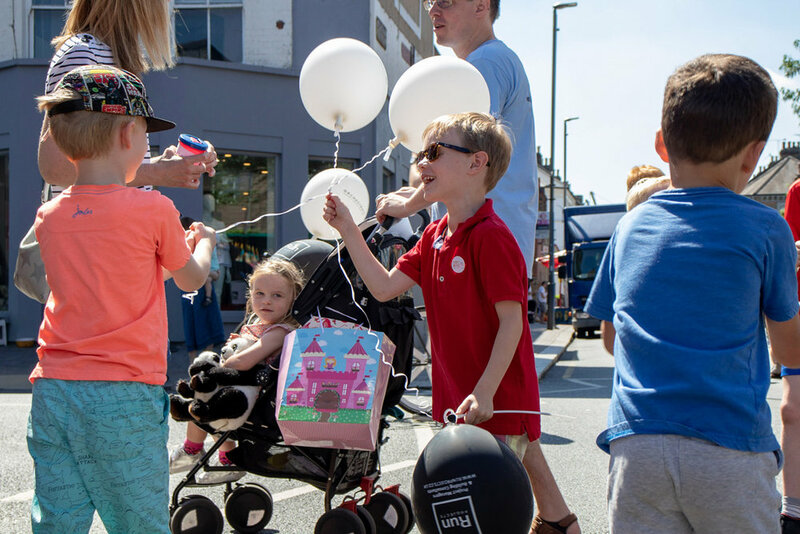 With temperatures soaring, the Northcote Road Summer Fête served up another fantastic community event with local residents and visitors out in force. 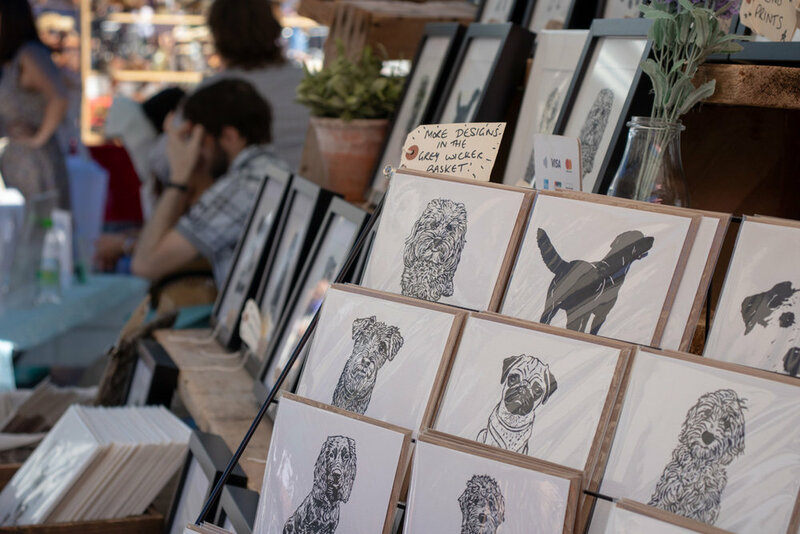 Battersea’s famous shopping street showed all the action from Wimbledon on the big screen, as well as hosting over 170 stalls selling an amazing range of clothing, jewellery, homewares, and accessories. The addition of a food zone was a big hit featuring street food from around the world and we were delighted to see the Northcote Pub going al fresco with an outside bar and hog roast by the main stage. The day offered something for everyone with a superb main stage, featuring performances by local groups, Precision Ballet Gymnastic, Let’s Act, Be Dance, Fancy Footwork and Good Toes School of Ballet and later the crowd was wowed by a range of wonderfully talented singer-songwriters. And of course the Kids’ Zone sponsored by Douglas & Gordon which included carousel rides, bungees, Zoola animals, play zone, face painter and new arrival Killik & Co’s activities hosted by @SharkynGeorge. What makes the Summer Fête even more special is the commitment from local businesses to help make the event happen and showcase their superb offer. The street is a haven of diversity, with specialist shops and boutiques, complemented by market stalls. Shoppers can find everything they need, from fishmongers and butchers to aromatherapy shops and bakers. The event is led by Northcote Business Network, chaired by Jonathan Dyson, Regional Director at Countrywide Plc. It is supported by the Clapham Junction Town Centre Partnership, Wandsworth Council and sponsored by Douglas & Gordon, Killik & Co, Flight Centre, Mamas & Papas, Linden Tree Nursery Schools, Portico NappyValleyNet and Hamptons. This year we would also like to thank the local residents and businesses who responded to the call for funding via the crowd funder page and charity pots, kindly displayed in some local business, which raised just shy of £4,000. Massive thanks to all of you. While it’s still fresh in your mind why not mark the 2019 date in your diary, as we are already planning for next year’s Summer Fête to be held on Sunday 14th July. Northcote Road Summer Fête - Latest News! The hugely popular Northcote Road Summer Fête is hitting Battersea’s famous shopping street once again on Sunday 15th July, serve up live coverage of the Wimbledon Men’s Tennis Final, plus fun for all the family with 170 market stalls, street food, live music and children’s activities. The road will be closed to traffic for the day to allow local residents and visitors to pack the street from 11am – 6pm and enjoy the many fantastic attractions on offer. There will be an outdoor big screen showing all the action from the Wimbledon Men’s Singles Tennis Final, as well as a superb main stage supported by Killik & Co, featuring song and dance performances from local clubs and groups plus wonderfully talented local singer-songwriters filling the air with fantastic tunes to keep the fun and friendly mood going. There will be over 170 stalls lining the street selling an amazing range of clothing, jewellery, toys, homewares, and accessories. A dedicated food court featuring street food from Brazil, Colombia, Caribbean, Ethiopian, India, Mexico...... plus many local restaurants and bars along the street going alfresco. And the Kid’s Zone sponsored by Douglas & Gordon will include a carousel ride, Zoola animals, assault course, face painter, interactive games and much much more. The event is led by Northcote Business Network, chaired by Jonathan Dyson, Regional Director at Countrywide Plc. It is supported by the Clapham Junction Town Centre Partnership, Wandsworth Council and sponsored by Douglas & Gordon, Killik & Co, Flight Centre and Mamas & Papas. Please Note: The Summer Fete finishes at 6pm and the big screen coverage, stage music etc will all end at this time. The event attracts a large crowd and we therefore ask you to leave your pets at home unless you require an assistance dogs The lost children point will be at Hamptons. Tip to minimise the time it takes to reunite parent and child, put a wrist band with a parents mobile number on each child in advance of attending. Save the Northcote Road Summer Fete! The Northcote Road Summer fete has been on the calendar for the last 20 years or so. Initially run as an extension of the current street stalls, then morphing into a music event and more recently as a more traditional fete, this massively popular community event is now timed to match the Men's single finals at Wimbledon and attracts over 10,000 visitors every summer. As times have moved on, the event has become more and more costly to run, with the overall cost now running to around £45,000. Although most of the organisers give their time for free, other costs such as 20 stewards, 20 security staff, bus diversions, giant TV screen, road closures and background security measures all cost money. The revenue from stall sales goes some way to covering the costs but in reality most of the funds are raised through sponsorship. Sadly due to security concerns and lack of sponsorship, the event was cancelled last year, however at the time someone did mention crowdfunding. If half of the attendees contributed just £5 to the event then we would have enough money to cover the current shortfall - around £10,000. We are therefore very much hoping that this crowdfunding page will attract enough income to help us stage the event this year. Thank you to everyone who came out to support the Northcote Road Christmas Fair on Friday 24th and Sunday 26th November. Once again there was a great crowd out on Friday night, visiting Hamptons Santa’s grotto, the real-life reindeers arranged by Rampton Baseley, and supporting the many businesses that put on special events including many charitable stalls. There was also plenty of mulled wine and a visit from Dunwoody, the Trotters’ pig. We would like to thank the choirs of Belleville, Honeywell, Dolphin and Bolingbroke Academy for their singing prior to the light switch-on by Snow Angel and Bear from the cast of Snow White Rose Red at Battersea Arts Centre. On Sunday, Battersea’s famous shopping street, already known as a haven of diversity with specialist shops, boutiques and restaurants, hosted an additional 70 stalls, offering an amazing variety of Christmas gift ideas. Residents were out in force to enjoy the cold but sunny day. In addition, The Ickle Pickles Children's Charity, who were joined by the very popular ambulance of the London Neonatal Transfer service, would like to thank everyone for their support which helped them to raise £1548. Special thanks to all the businesses and traders who donated the 80 wonderful prizes. Finally we would like to thank the following businesses for their generous support, without which the event could not take place: Estbury Basements, Artesian, Like Minders, KiddiPlan, Flight Centre, Hamptons, JoJo Maman Bébé, Kinleigh Folkard & Hayward, Mamas & Papas, Marsh & Parsons, Osteria Antica Bologna and Trotters. The event was led by Northcote Business Network, chaired by Jonathan Dyson, which is supported by the Clapham Junction Town Centre Partnership, Wandsworth Council. The media sponsor was NappyValleyNet.com. Northcote Road is once again kicking off the Christmas season with the annual light switch on, Friday 24th November, followed by the popular pop-up Christmas Market on Sunday 26th November, 11am – 6pm. On Sunday Battersea’ s famous shopping street, already known as a haven of diversity with specialist shops, boutiquesand restaurants, will host an additional 75 stalls offering an amazing variety of Christmas gift ideas. On behalf of Wandsworth Council all businesses local to Clapham Junction are warmly invited to attend a Visioning Event to discuss the future of the area. Hear the findings from the questionnaire about local businesses' priorities for the future development of the area, followed by a discussion of how businesses can work together to make trading conditions even better and take advantage of new opportunities. Tickets on sale for Wandsworth Council’s 2016 Battersea Park fireworks display. Get ready for Battersea Park’s incredible annual firework display. Bring your friends and family to watch as fireworks dance across the night’s sky to music made by legends. Tickets for Battersea Park’s fireworks display go on sale on Thursday 1 September. This year’s event will be taking place on Saturday 5th November will be themed ‘Legends’ and will include music and light effects. Wandsworth Council’s Battersea Park fireworks display is managed and delivered by Enable Events Team, proudly sponsored by Knight Frank Battersea and Nine Elms. Learn more about what it really means to become self-employed at this free workshop. In this workshop you will learn more about what it really means to become self-employed, and will be given an outline of the factors you will need to consider such as: tax, national insurance, legalities, why many new businesses fail, USPs and sales marketing. You will also have the opportunity to meet with other like-minded people who are also considering starting a business. Clive Lewis is Head of Enterprise at the Institute of Chartered Accountants for England and Wales. He started his career at a small firm of chartered accountants based in Cardiff and after 20 years in a variety of business finance roles he joined the ICAEW, where he has worked for 18 years. In his current role, in addition to advising many start ups and early stage businesses, he writes articles for the media and gives presentations on SME issues. A guest speaker who runs their own local business will be invited along to share their enterprise journey and tell you about the challenges they have faced along the way. To book please go to our booking page (Eventbrite). Wandsworth Enterprise Workshops are a series of free events designed to enhance and aid in the set up of and the growth of your business. For more information please email Open4Business@wandsworth.gov.uk. A powerful business plan is a core foundation for profitable growth. Join us at this interactive Masterclass to gain the skills needed to create a compelling business plan. Whether you are starting a business or looking to grow your existing one, why not join us at this free, interactive half-day Masterclass which will equip you with the tools and knowledge you need to create a compelling business plan? Keynote speaker Simon Lewis, Pro-actions Regional Director. Simon's interactive presentation will be drawn from practical experience gained over 30+ years in the Financial Services sector supporting SME businesses. Pro-actions are results-focused Business Improvement Specialists who help business owners address their issues, improve their results, and kick start growth. Spaces for this Masterclass are limited and in high demand so book now to avoid disappointment. Booking is essential. To book please visit our booking page (Eventbrite). Wandsworth Enterprise Workshops are a series of free events designed to enhance and aid in the set up and in the growth of your business. For more information please email: Open4Business@wandsworth.gov.uk. Celebrate International Paella Day with Lola Rojo! FIESTA! In honour of Spain's national dish, the team at Lola Rojo will be hosting a 3 day long fiesta, kicking off on International Paella Day on Friday 27th March. Chef Antonio (co-owner of Lola Rojo with wife Cristina) is particularly proud of their rice dishes and uses recipes originally taught to him by his Mother, who still cooks paella every Sunday for their family back home in Spain. PAELLA! Every lunchtime on Friday 27th, Saturday 28th and Sunday 29th, freshly cooked paella from the Lola Rojo kitchen will be served on the terrace, at the front of the restaurant, ready to take away. As always, their delicious selection of paellas will be served at lunch and dinner in the restaurant. OFERTA! Enjoy paella at Lola Rojo on this special weekend and you will automatically qualify for their very special offer: 25% off all drinks at both Lola Rojo and their little sister venue Rosita & the sherry bar, located just a few doors away, also on Northcote Road in Battersea. Plus be entered into a special prize draw to WIN a MEAL for TWO at Lola Rojo. More details about the Xmas Lights! Yes it’s that time again, so unpack your elf outfits, dust off your wallets and practice your carols. The Northcote Road Christmas lights switch on will take place on Friday 28th November at 6pm. Once again, Belleville & Honeywell choirs will be singing carols down Northcote Road from 5.30, culminating at Bennerley Road for a community sing song. Due to the overspill onto the Northcote Road last year we will be temporarily closing Bennerley Road from Northcote Road to Webbs Road for a couple of hours to create a focal point for all things festive (Christmas jumpers are an absolute must). The Battersea Arts Centre will be putting on a one off mini performance of Antarctica, we have all new lights to festoon Northcote Road and Santa will be back at his Grotto in Hamptons from 4pm – 7pm. Once again, the local businesses have put their hands in their pockets and sponsored a hundred Christmas trees along the street. These will be placed outside participating businesses so be sure to pop in and say thank you. On the same theme, many of the shops will be staying open late and having special discounts & events to help you make the most of a fun Friday night out. On Saturday the Hamptons elves have been slaving away booking a whopping seventy stalls from the summer fete to trade for the day. We don’t close the street for the winter market but there really is a huge range of traders to suit every pocket. They will be there from 10am – 5pm so do come along and help everyone get into the Christmas spirit. Please keep your eye on nappyvalleynet over the next couple of weeks as we’ll be regularly posting what’s happening and who’s doing what on the night of the lights. The Northcote Road Summer Fete took place on Sunday 6th July from 11am - 5pm and a brilliant event it turned out to be. The whole road was closed to traffic all day for the event - no parking and no buses - and the street filled with food & drink, market stalls and plenty of summertime fun for all the family. Popular entertainment featured included community ping pong tables, a performance stage, three fairground rides and plenty of games for adults and children of all ages. All your favourite shops, bars, restaurants and and businesses on Northcote Road opened their doors onto the pavements and spilled out onto the street, offering everything a summer fete should. Visiting stall holders were found in the pop-up markets and dotted along the street, selling beautiful jewellery, handmade cards, childrens clothing, homewares and so much more. Thousands of visitors feasted on the huge selection of delicious food and drink choices on offer from ice creams and cakes, burgers, French crépes, Pimms, locally brewed ales, all served by your favourite eateries and drinking spots from Northcote Road and around Battersea. The children’s fairground rides returned, with classic spinning teacups and a toy set roundabout. Back by popular demand was the AstroGlide with its two separate lanes. Riders on this mega slide were given a hessian sack to slide down this 70ft long ride. The entertainment stage featured dance and musical performances from local schools and clubs. Eight ping pong tables, which were free to use, were arranged at intervals up the street. There was no need to miss the Wimbledon Men’s Final as all the action from SW19 was shown on a huge screen in the middle of the event. The entrance to Bennerley Road was absolutely packed with people sitting in the sunshine to enjoy the tennis. This year’s official charity partner for the Fete was Ickle Pickles. The Northcote Road Business Network was very pleased to be working to raise awareness and charity funds for this worthy childrens charity. Ickle Pickles work to help babies who need intensive care in Neonatal Units. The Northcote Business Network would like to thank all the sponsors of this year’s event - without the generous support of these kind businesses, this event could not take place. Special mention goes to the principal sponsor: John Thorogood estate agent. The event was brought to you by The Northcote Business Network, supported by the Clapham Junction Town Centre Partnership and Wandsworth Council.